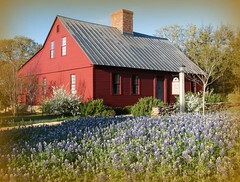 In the corner of metropolitan Winston Salem, North Carolina is a tiny historic village, named Old Salem. Many years ago, in this village lived two sisters who were avid doll makers. Both were talented seamstresses, both endeared to children and a love of dolls. 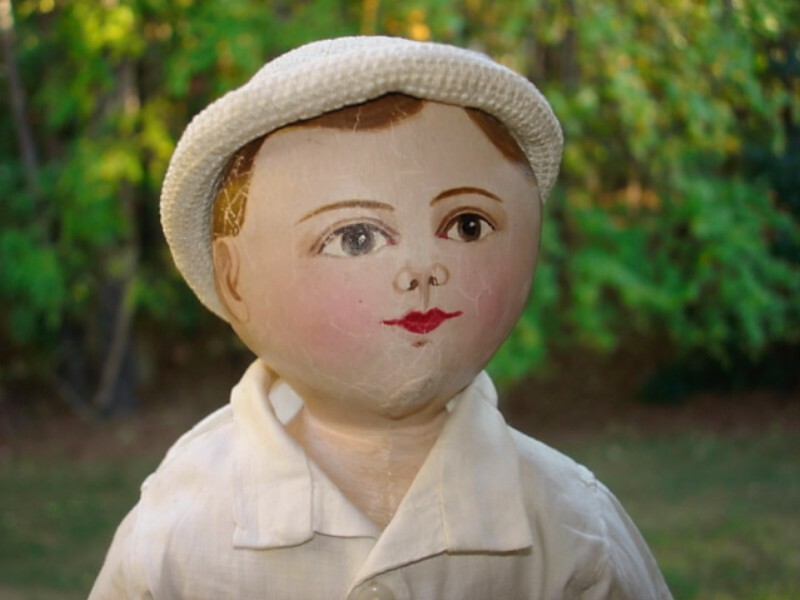 This is the story of an American doll created in my home state, a North Carolina Cloth doll. Salem was settled in 1766 by Moravians who cam from Pennsylvania as missionaries to the backwoods of North Carolina in 1753. After starting two small villages, they felt the need of a center for their industries. Salem merged with Winston in 1913, the hub of tobacco factories, and is now known as the city of Winston Salem. The older village of Salem has become a tourist attraction, similar to that of Williamsburg, and is called Old Salem Inc. At one time they had a vast Toy Museum, which just recently closed. This museum had well over 20 Maggie Bessie dolls both on exhibit and in their archive. Margaret Gertrude Pfohl (Maggie), 1877-1965, and Caroline Elizabeth Pfohl (Bessie) 1870-1959, were Moravians in Salem. The Pfohl sisters were never married but were very active in their community and their church. This is apparent in the many projects that the started to create items for entertaining children. They taught sewing, painted china, and Miss Maggie started the tradition of the first “Putz” or scene, under the community Christmas tree at the Home Moravian Church. This is a tradition that continues to this day. A “Putz” is a German tradition brought by the Moravians to their settlements. Relatives of the Pfohl sisters regale the memories of this tradition, are quick to share stories of visiting their home during the Advent season. 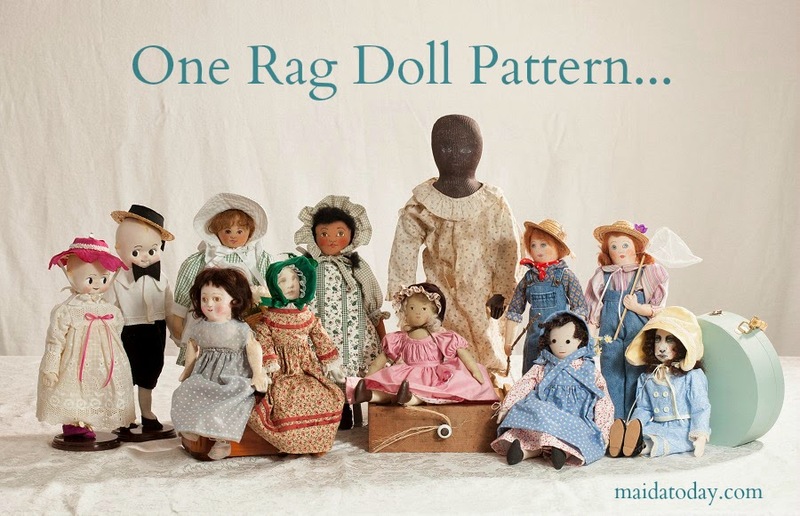 Starting in the early 1890’s, Miss Maggie and Miss Bessie redrafted a pattern belonging to their mother to create some of their first dolls. This pattern had been utilized by Mrs. Pfohl to make dolls for her children. Mrs. Pfohl (Margaret Caroline Siewers Pfohl 1838-1929) was herself very artistic and understood the importance of dolls to children. This pattern proved far too simple for their tastes. 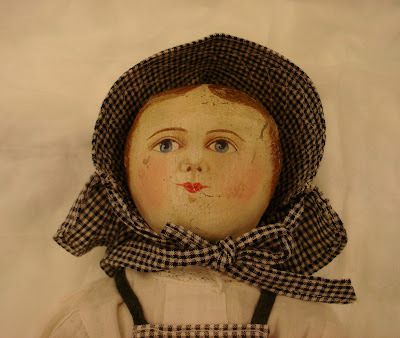 The dolls purportedly made by Mrs. Pfohl are very rare and differ greatly from those we now call the Maggie Bessie Dolls. They are flatter with a gusset at the top of the head, and the face painting, although well done, is more primitive. Few of these dolls exist, and it is difficult to say with certainty their provenance. They enlisted a dear friend, Elizabeth (Emma Louisa) Chitty, and she helped the sisters refine their pattern and improve their techniques. 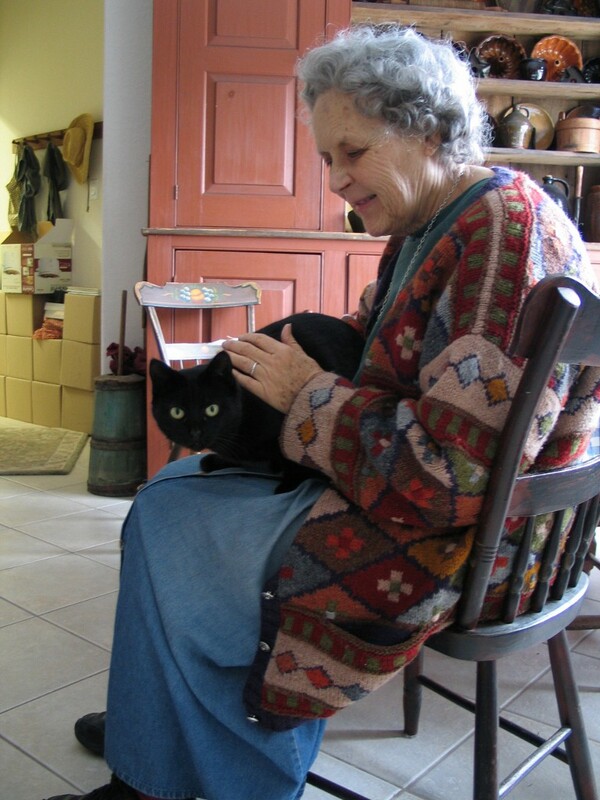 She was an instructor of needlework and mathematics at Salem Academy and College with whom Miss Maggie had studied. 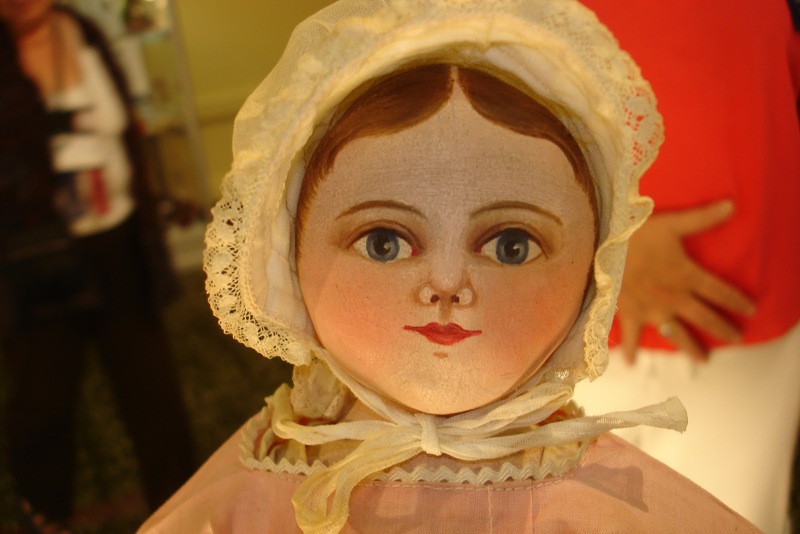 A doll maker herself, she is the creator of the elusive cloth doll known as “Miss Chitty”. Joining forces to perfect these early dolls became a group effort. The final result was the pattern for a doll that would measure 19 inches. From that pattern, utilizing similar shapes, they sized down, and worked at creating a manageable standard pattern. This started a tradition that lasted for over fifty years. The late Catherine (Catty) White was the first to speak of these dolls to me. When Catty, a well known doll dealer at the time, told me that these were her favorite dolls I became intrigued immediately. She was instrumental in bringing more knowledge of these dolls to all those interested. 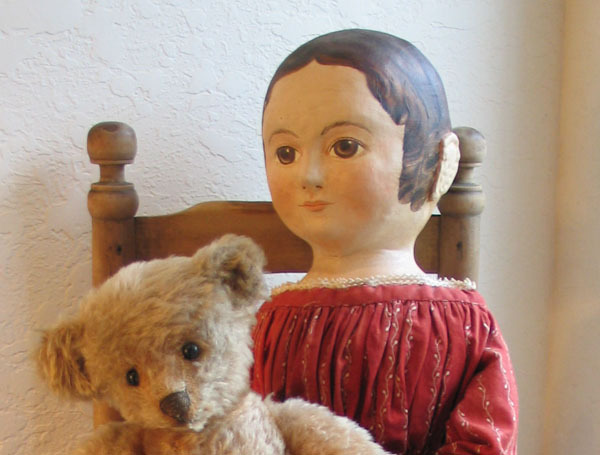 Catty worked with an antique dealer who called her each time he found a Maggie Bessie doll. The dolls, apparently simple in construction, are charming and have a wonderful feel of Americana. Catty was generous in sharing her knowledge about them although there were few articles about them and no reference in the Blue Book. In our conversations, Catty referred several times to a friend Elizabeth (Libby) Holder, a Moravian from Winston Salem now living in a retirement Community in my Town of Chapel Hill. It was only a matter of time before our paths as doll collectors crossed and confessed a mutual affection for the Maggie Bessie dolls. Libby owns three of them, especially made for her by the Pfohl sisters. Libby was a newspaper reporter for the Winston Salem Journal and the Twin City Sentinel in Winston Salem. She was a Bride to be when she interviewed the Pfohl sisters shortly before Christmas 1942 about their doll making for an article. She tried to order a doll for herself at the time, but after some obvious hesitation, they refused to accept her request, saying they were so filled with Christmas orders they could not do any more. On Christmas morning, however, Libby found a Maggie Bessie doll had been left for her by Santa Claus. A few days latter Miss Maggie called Elizabeth, saying that they doll had been order by her new husband and they were trying to protect his surprise when they turned down her request. She was told that they would be happy to make her another doll is she wanted one. After much consultation Libby settled on a boy and girl doll. 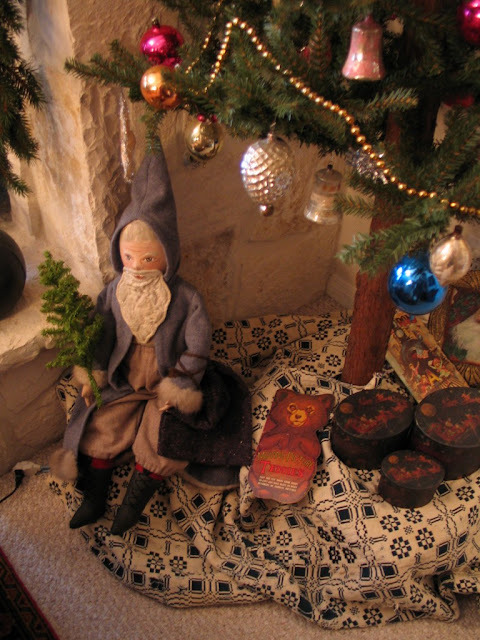 The Christmas doll is dressed in a style from the early 1800’s. The two later dolls that Libby bought were dressed in styles from the early 1900’s. Named by the sisters, Kate is wearing a pink dress with bonnet. Will, also named by the makers, is wearing blue button on shorts, white shirt, socks and a crocheted bowler style hat. Both dolls wear inexpensive store bought oil cloth shoes. They told Libby they used these to keep the prices of the dolls affordable for children. Libby clarified for me several items in the construction and production of the dolls. Each sister did her share of the sewing. Miss Maggie did most of the painting of faces which were primed with white house paint, then sanded with emery before the features were added in oils. The faces are gentle, sweet and very consistent. For girls, the painted hair is parted in the middle, for boys on the side. Dolls have been found with and without painted ears. The girls have blue eyes, the boys have brown eyes. Each part of the doll is constructed separately and joined together (i.e. the upper arms is separate from the lower arm). Although I have stated that the dolls are simple, closer inspection of the construction testifies that the pattern is quite complex. Several pattern pieces were used in the head and a series of darts give shape. There is a center seam in the back and on the front a dart creates the chin and forehead. The dolls are tightly stuffed with cotton batting, and a wooden dowel creates the “spine”. Without the spine, the sisters said, the dolls would nod. There are three documented patterns for three sizes: These are documented as 1 small, 13-14 inches, 2 large, 17-18 inches, and 3 “great big” 20-22 inches. Improvements were made to the pattern whenever needed. The size 1 dolls have 3 pattern pieces for the head. The larges sizes have 5 pattern pieces, though early examples in this size have been found with 3 pattern pieces. This documents their evolution and desire to improve their creations. 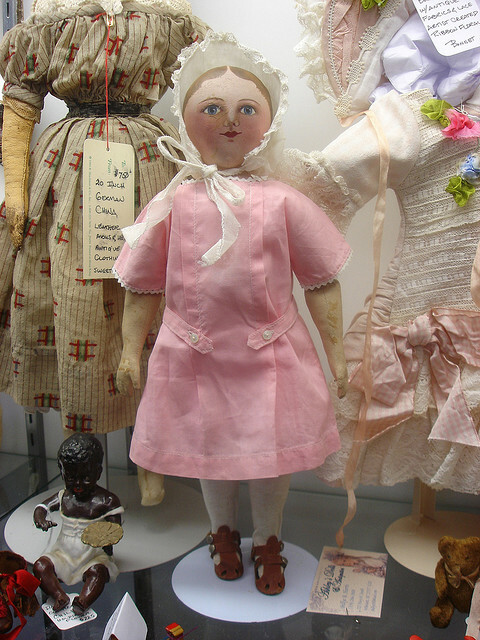 Dolls were dressed in simple dresses usually in pink or blue cotton. Some have been found in gingham and calico prints. Girls wear a petticoat over one piece undergarments. The dresses vary but the typical style is a short sleeve dress pleated in front with a low belt round the waist. 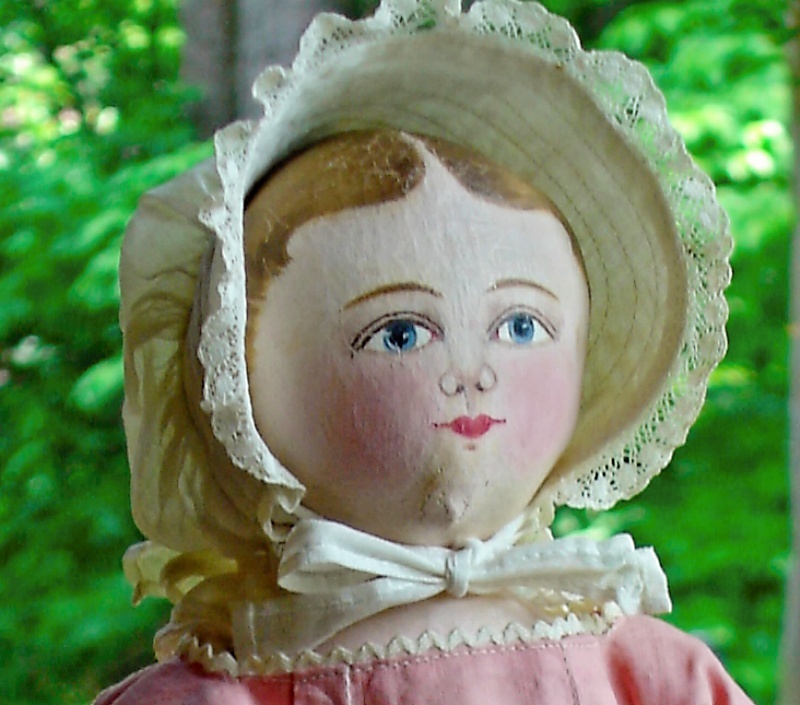 As with Libby’s first doll, she was dressed in an early 1800’s fashion with full skirt, pantalettes, and the traditional Moravian “Haube”, a prayer cap worn by all Moravian women to church. The haube, are sometimes made of a stiff crinoline or lawn fits close to the scalp and have rows of pleated crinoline around the crown and tied under the chin with a ribbon. The color of the ribbon designated the marital status of the person wearing it. Girls under the age of confirmation wore red ribbons, unmarried women wore pink, married women wore blue and widows wore white. 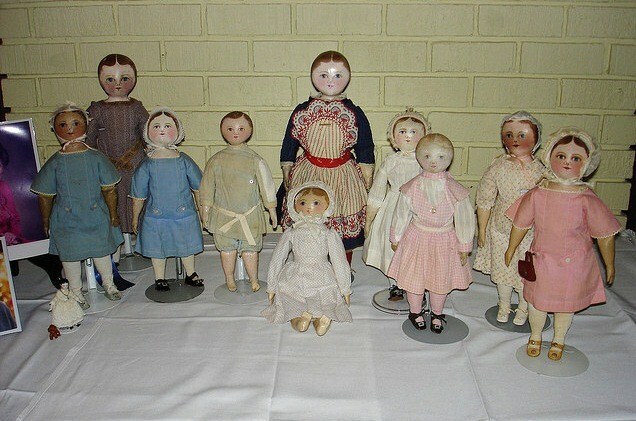 The dolls originally sold for $1.00 each but by 1942 when Libby bought her two dolls, the price was up to $6.50. The sisters had decided early in their career to try to keep prices down so no child would have to go without. 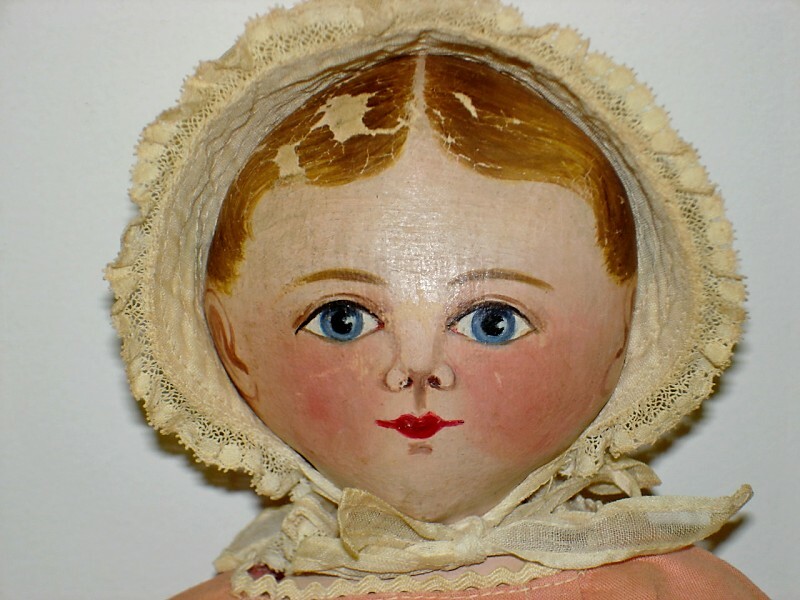 The dolls they created are by far the best known creations, but they also made other playthings as well, sock toys and stocking dolls, organdy bonnets for dolls with hand painted flowers and they were known to have dabbled in doll repair. 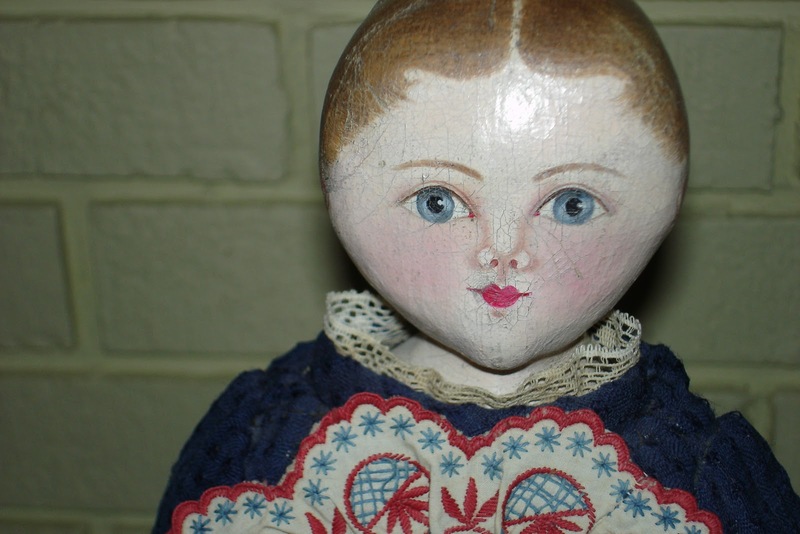 A Maggie Bessie doll head and arms has been found on a German Kid leather body. The bisque head of this doll met an untimely fate, and was replaced by the sisters with a head of their own creation. 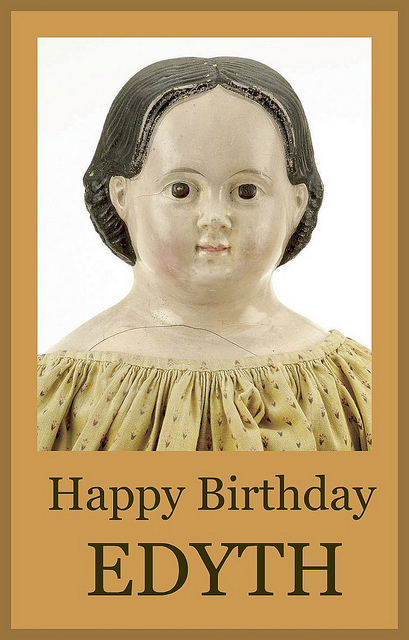 Maggie Bessie dolls were treasured by their owners and have been passed down from generation to generation. Speculation is that there were fewer than 500 of these dolls made, though and early article gives a much lower number. 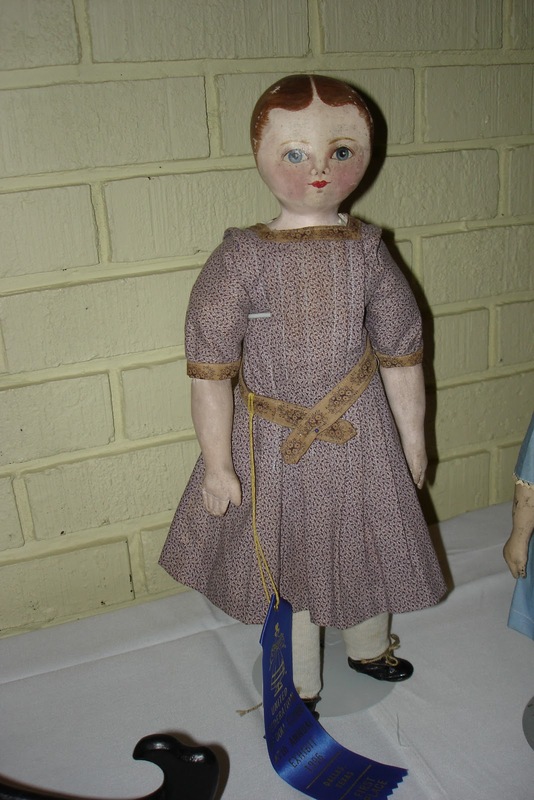 Production of these dolls began in the early 1890’s, the earliest entry in the sisters’ business journal being 1897. 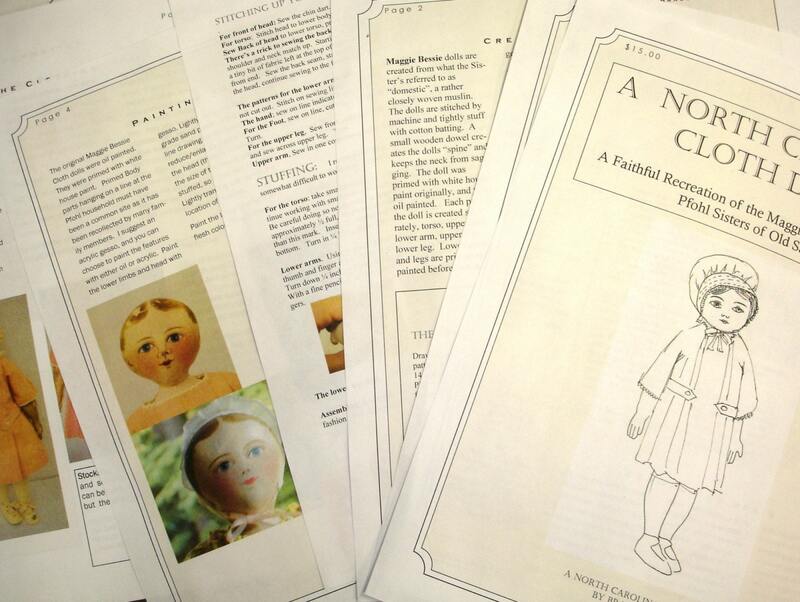 This journal, a simple composition book, documents 435 dolls made from 1897 through 1918. It contradicts an early speculation that the sisters only produced 130 dolls. Most of the dolls were made for local people of Salem; the names appearing in this journal are names active in the Moravian community. Records also show that they shipped to Colorado, Texas, New Jersey, Alabama, and Pennsylvania. 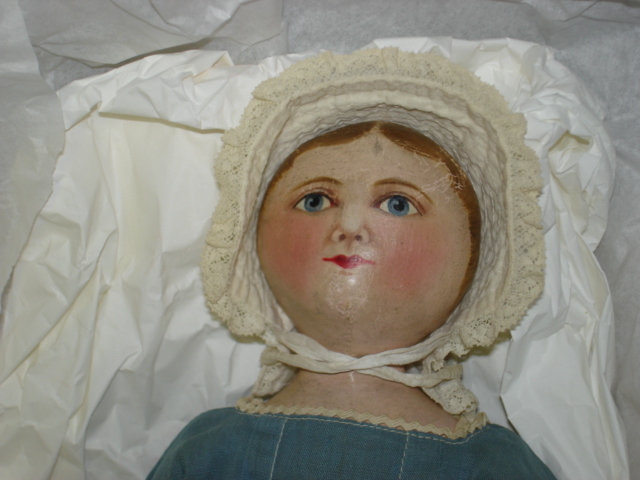 After the death of the both sisters, the importance of these dolls was soon discovered. 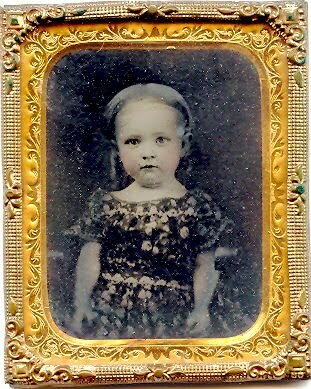 Collectors of both dolls, ephemera of Old Salem, and Americana all compete for Maggie Bessie dolls when they rarely are offered for Sale. What I have discovered was that so many of these dolls were loved to pieces and have since vanished from the face of the earth, but memories still live in the hearts of many, while others are coveted family heirlooms that are passed on to eldest daughters. The dolls that Libby received in 1942 went on to be played with, not only by her daughter, but by her grandchildren as well. 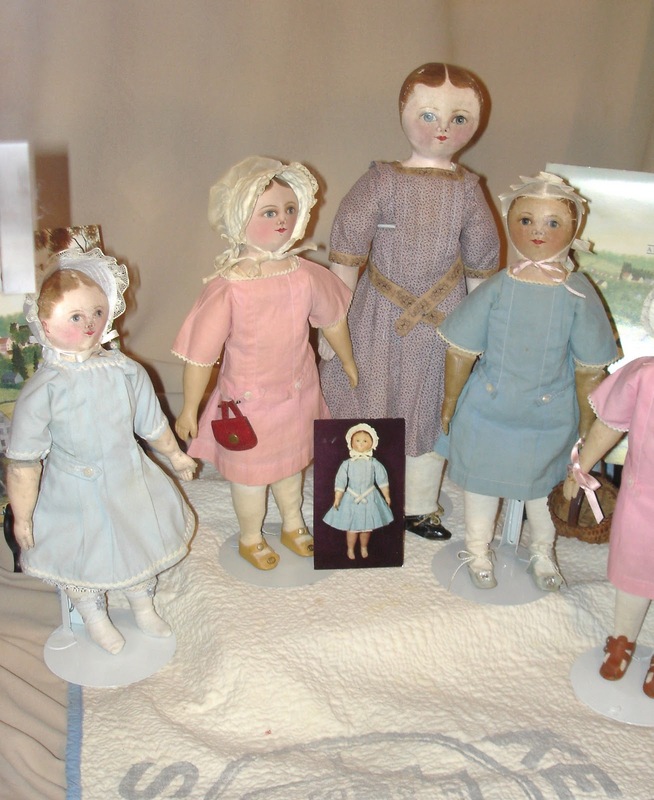 The nostalgia and memories of these special dolls created a demand for similar dolls to be sold in the gift shops of Old Salem where they now offer an inexpensive inspired version of the Maggie Bessie dolls. The quest for information and history of these dolls became a passion for me and I think I am more passionate now about the history of the sisters, their techniques, and their doll making than I am of the dolls themselves. I have had the pleasure to see well over 100 examples of these dolls and photograph them extensively. 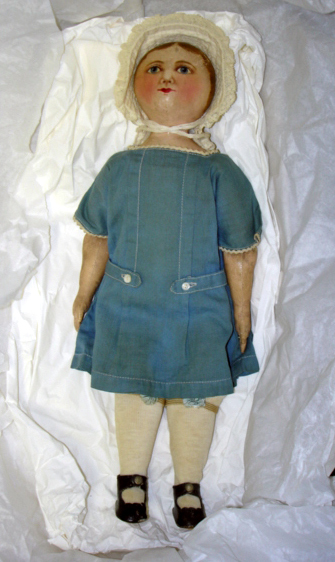 Many owners allowed me to undress the dolls to study the clothing, varying construction and painting of each doll. 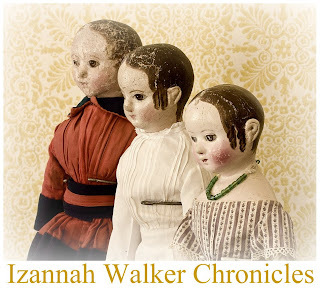 As I began this research I was able to speak to several people that were related to, or had known the Pfohl Sisters and get first hand accounts of their doll making. As time has marched on, sadly, many have now passed away. 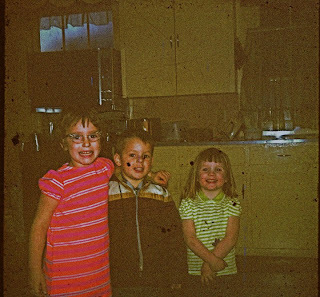 Libby Holder passed away in October of 2009 reminding me that a history unwritten is lost forever. Sad, but it is very true. I feel privileged that I was able to work with her on my research. Even though Maggie and Bessie have passed on their dolls continue to bring joy to collectors in North Carolina and the world. As I said previously I was able to view many examples of these dolls, measuring them, sketching, studying and photographing each one. 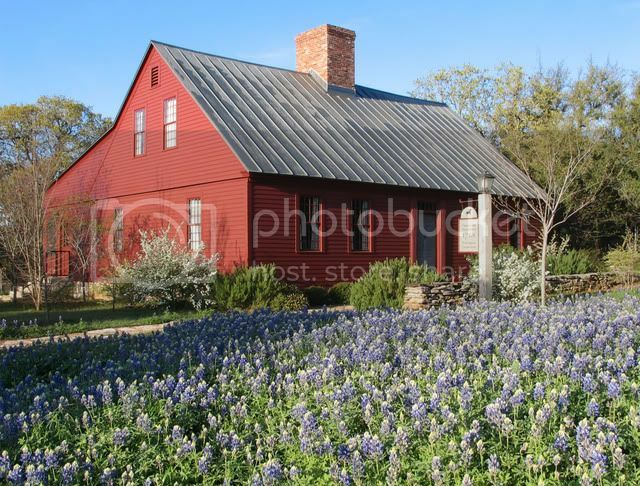 I share many of (but not all) of my photographs on my Flickr photo site. (Some do not want images of their dolls shared publicly, so I have them for research and when I do programs on the dolls) This is a great way to see variations, facial panting, and details. I spent many hours creating from my sketches and measurements a pattern to make myself a Maggie Bessie doll. My first attempts were marginal at best, as each creation lacked some detail that the originals possessed. In 2007 when I was allowed to see the original patterns, I was able to see many subtle details in the patterns that fixed many of the “issues”. I redrafted a corrected pattern, and my example is as near to the original as you could possibly get. As I make the dolls on occasion for friends and family, I try to stay as close to original techniques as possible utilizing the same materials, stuffing and techniques, I prefer to be as authentic as possible. I even use a red marking pencil, as the sisters did, when they transferred their pattern to the fabric. Details however minute are important to me. 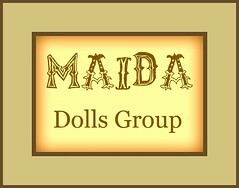 The pattern that I offer for sale is years in the making, much trial and error, and was a total labor in love to preserve the doll making techniques from my home state of North Carolina, and the dolls loved by my dearest friends. I hope that you will enjoy making your doll. Visit Bradley's Esty Site to purchase the pattern.